At 16 years old I was sitting atop a hill watching a group of Palestinian refugees demonstrating at the border between Lebanon and Israel. They were angry, and they were yelling at the fence separating the two countries in front of them. This fence was a culmination of their anger, why they have to live in refugee camps where the power shuts off six hours a day, why they are discriminated against even if they have lived in Lebanon for most (if not all) of their lives, and why no matter what their level of education is it is illegal for them to have any sort of proper work. I watched tears stream down people’s faces; this moment was the first time in over 60 years that many had seen their land, feeling the breeze brush against their face for the first time since they were young. For others, this was the first time they had even seen this place that they had heard so much about. Pop. A sniper had been shot; such a simple sound had just ended a life. Pop. Pop. People walked around silently watching the demonstration. How many have died? Five? Twelve? Rumours traveled as ambulances, army vehicles, and Hezbollah members arrived onto the scene. No one knew what was going on. I came to this site to have a barbecue with my students (I was volunteering as an English teacher at the time), and somehow I had arrived to a demonstration with a death count. After hours of sitting there, watching the scene, Lebanese soldiers started to line up. The onlookers watched, curious as to why the formation was happening. All of a sudden rapid gunfire started, as if popcorn in the microwave has hit its climax. Unsure what to do, I start looking around. Where is my father? Last I had seen him he was down at the border. The gunfire continues as I see that there is no cell reception. “DUCK” a group of people yell to me in Arabic and motion for me to follow them. Running on adrenaline, we frantically crawl up the steep, muddy hill, hands scraping against thorns and rocks hoping that war was not breaking out as we speak. We looked back as the crowd disperses, following us up. Finally the shooting stops; I look around at the people panting, catching their breath. Our bus was parked miles away from the protest and my father and I walk back through tobacco and wheat fields. We talk with many people trying to find the true story about what happened. In the end we learned 10 people were killed and over 100 people were injured. One kid who was killed was fifteen, younger than I was. We also found out that a family friend’s child was at the demonstration, he was a university student and now paralysed and in constant pain. “You know the funny thing about a sniper,” my father starts talking, “is that you have to chose your target”. To this day I am in disgust. These people who had lost so much took their anger out on a fence, and in return they were punished. After my time in Lebanon, I went back to school in North Hollywood. On one of the first few days I came back, a friend wanted me to share this intense day with other people. So of course I did, and I left out no detail, I shared the emotions, the strife, the drama of that day. “Oh no way,” one of my friends responded looking excited, “you know I was once at the border too, in Israel. The soldier let me hold his gun and everything”. I was dumbfounded, you have to be shitting me. For some background, Los Angeles is a place that most people see Israel as being a place that could do no wrong. This girl ignored the deaths, the emotions, discarded the idea that life was lost that day; the first connection she made was that she held the soldier’s gun, the same gun that had killed the fifteen year old boy that day. For more information on the Lebanon Nakba March visit this site. Iman Yashruti is an International Relations student at the University of Edinburgh. Hobbies include whacking people with bamboo sticks (for both fame and sport), collecting baking recipes and fulfilling dates with her life partner Netflix. These interests were planted and cultivated in L.A., so like omg sorry about the occasional and horrifying valley girl accent. I read this article and found it very interesting, thought it might be something for you. 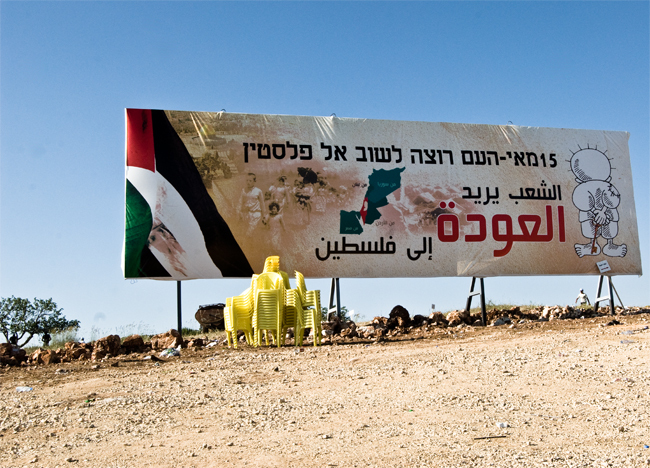 The article is called Al-Nakba: My Trip to the Border and is located at http://prancingthroughlife.com/2014/02/24/al-nakba-my-trip-to-the-border/.